Giuseppe Fortunino Francesco Verdi (10 October 1813 – 27 January 1901) was an Italian Romantic composer, mainly of opera. He was one of the most influential composers of the 19th century. His works are frequently performed in opera houses throughout the world and, transcending the boundaries of the genre, some of his themes have long since taken root in popular culture - such as "La donna è mobile" from Rigoletto, "Va, pensiero" (The Chorus of the Hebrew Slaves) from Nabucco, "Libiamo ne' lieti calici" (The Drinking Song) from La traviata and the "Grand March" from Aida. Although his work was sometimes criticized for using a generally diatonic rather than a chromatic musical idiom and having a tendency toward melodrama, Verdi’s masterworks dominate the standard repertoire a century and a half after their composition. Some critics maintain he paid insufficient attention to the technical aspect of composition, lacking as he did schooling and refinement. Verdi himself once said, "Of all composers, past and present, I am the least learned." He hastened to add, however, "I mean that in all seriousness, and by learning I do not mean knowledge of music." Many of his operas, especially the later ones from 1851 onwards, are a staple of the standard repertoire. No composer of Italian opera has managed to match Verdi's popularity, perhaps with the exception of Giacomo Puccini. 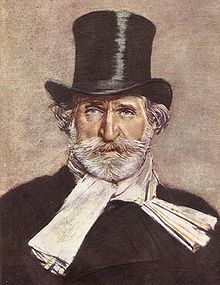 Click here to view all items related to Verdi.